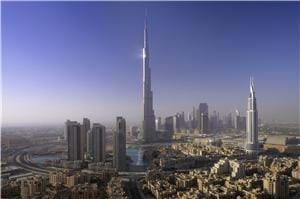 The Burj Khalifa in Dubai, at 828 metres, is the highest building in the world. The tower was inaugurated in January 2010. The observation deck on the 124th floor of the tower at 440 metres offers a fantastic view of the impressive Dubai skyline. ZINKPOWER Middle East galvanized parts of the steel construction around the entrance.